Drawings of Robert Perry’s carbon cutter show the large keel that accommodates enough water and fuel tankage for extended periods at sea. There’s no centerline double berth here; all sleeping accommodations are secure sea berths. The D/L is 279. Lord knows not every boatbuilder recovered from the latest economic maelstrom of biblical proportions to hit the industry (2008), but “Survivor III” Jim Betts (see Professional BoatBuilder No. 139) of Anacortes, Washington, must feel like he’s walking on water these days, thanks to clients who ordered four cookie-cutter carbon cutters—that is, four identical 43‘ (13.1m) Robert Perry–designed offshore cruising sailboats. Here’s the backstory: The principal client, who owns land in the San Juan archipelago northwest of Seattle, is a sailor who once owned a Cape George Cutter. Worried about environmental, manmade, and God-made disasters like Armageddon, he commissioned Perry to design a sailing yacht, somewhat similar to the cutter, that can voyage from the U.S. to New Zealand nonstop. Or in Perry’s words, “Go offshore and stay offshore.” That was the June 2015 design brief. And the result is unusual. From their first discussions the client and partners insisted on an outboard rudder for easy inspection and sheer ruggedness; Perry says that by removing a long titanium rod it can be disengaged from the boat in the water (confessing in an aside that he wonders why anyone would undertake such an operation). A split house, found on some old Atkin designs, also made the early must-have feature list. 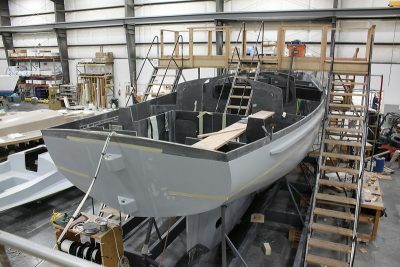 The four cutters are being built at Betts Boats. Here, the keel is laminated with a quasi-isotropic (QI) carbon fiber stack comprising four layers: 11-oz 0/90, 1-oz double bias (DB), 11-oz 0/90, and 11-oz DB on either side of 1⁄2″ (12mm) E-glass. The bilge outside skin is in place and is made with the same QI stack on either side of 1″ (25mm) Corecell A500. Above the waterline, the laminate has yet to be applied over the core, but the M100 Corecell used above the waterline to minimize print-through is visible. 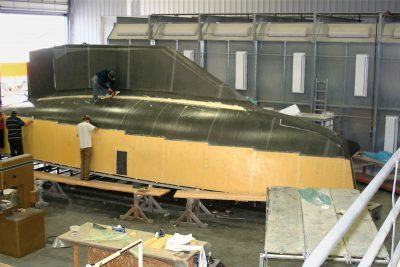 One can also see the single-skin area in way of the chainplates, where there is no core; instead, Betts employs the basic eight-layer hull laminate detailed above, along with two additional 20-oz carbon unis running down to the keel. All lamination utilizes API’s DR-5 rubber-toughened epoxy. Notable is the very large keel, dictated by the humongous capacity of water and fuel tanks—1,136 l and 606 l (300 gal and 160 gal), respectively. Perry says he wanted external lead ballast, but “if all the tanks are in the bilge, you’re never going to see your keelbolts. So we went internal. There is plenty of volume in that big keel.” Which ended up, at the client’s wish, somewhat longer and carried farther forward than Perry preferred. There are no individual through-hulls. A sea chest located at the bottom of the keel, starboard side aft, receives all intakes through a perforated 10“ x 10“ (254mm x 254mm) brass plate; and a dump chest at the bottom of the keel, portside forward, discharges all fluids. When discussing possible builders, Perry suggested Betts Boats, which would be convenient for the client to visit, given Anacortes is home to the ferry terminal for the San Juan Islands. “Next time I visited the client,” Perry says, “he’d visited Jim [Betts] and said the boats would be carbon fiber. End of story. He’s a pilot, technically astute. He’s not afraid of carbon fiber like some sailors. Jim thinks carbon is the best material to build a boat, and he’s done 17 or 18 now.” Though Betts gave the client a fixed bid, according to Perry the client preferred to work on time-and-materials, saying bids are excuses to cut corners, and he doesn’t want any corners cut. The displacement/length ratio is 279, not much higher than Perry’s Hall of Fame Valiant 40 (12m), regarded as the first of a new breed of “performance cruisers” when it was drawn in 1973. With the hull righted and painted with ProLine epoxy barrier coat and Awlgrip topcoat, work on the interior begins, with foam-cored carbon bulkheads and panels. To build the cutters, a female mold was rejected because of the need to orient the carbon fiber fabrics along identified load paths, so a male plug was constructed with CNC-cut poplar frames and strip-planked. Corecell of varying densities is sandwiched in the hull, deck, and interior. No plywood is to be found on the boat. The generous sail plan incorporates a long bowsprit to fly an asymmetrical spinnaker. Below it is a false foam-filled fabrication on the stem, a sort of “crash box.” But that’s not its purpose. “I have a little tumblehome in the stern,” Perry explains, “and in order to get the boat off the male plug we have to push the hull aft as we lift it up. In order to push it off we had to put an angle on the bow that gave us the geometry and tolerance to lift the hull clear. A big chunk of foam goes on to define the stem that you see, bonded with carbon fiber.” That, and another reason: the aesthetic of the Bristol Channel Cutter’s formidable bowsprit. As of this writing, hull #1 is nearly finished; carpenters are dry-fitting the teak caprails. Hulls #2 and #3 are right-side up and progressing with interior joinery and hull fairing. Hull #4 is in the on-deck circle. Perry lives but an hour from Betts’s shop and so visits every Wednesday, with his Portuguese water dog, Ruby, to mark progress—a boon to the owners. The Lord helps those who help themselves, and in Perry and Betts, owners of these four carbon cutters have placed themselves in very capable hands. 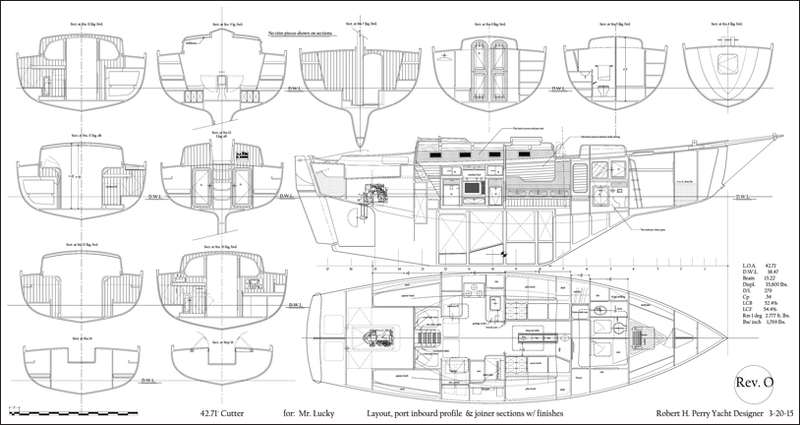 Robert H. Perry Yacht Designers, 11530 Tulare Way West, Tulalip, WA 98271 USA, tel. 360–652–7771, website www.perryboat.com. Betts Boats, 416 34th St., Anacortes, WA 98221 USA, tel. 360–299–2311. Send mail to: P.O. Box 991, Friday Harbor, WA 98250. Website www.jbeinc.com.